Just have to document here the appearance of this gorgeous moth on one lovely afternoon in our tropical garden last December 12th. It looked so pretty, resting on the dark green foliage, in wonderful contrast! I’m so delighted that I had browsed through my photo archives of garden visitors today, otherwise I’d missed out this attractively patterned moth. Though small, probably about an inch, it is beautifully adorned with white and brown symmetrical designs, and fabulously bordered in brown on both fore wings and hind wings. 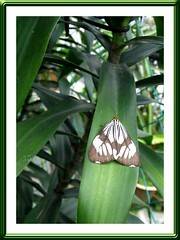 It is a kind of Tiger Moth, belonging to the Marbled White Moths group that are day-flyers. A species commonly found in secondary growth and various habitats from the lowlands to 1200 meters. And, these beauties are widely distributed too, ranging from India, Sri Lanka to South China, Taiwan and Japan, Malaysia, Singapore, Sumatra, Java, Philippines and New Guinea. Host plants are Gynura and other Compositae.